I have been reading your articles on seekingalpha.com for a while now. They are truly enlightening when it comes to DGI. In most of your articles, you refer to ‘assuming an optimal tax strategy’. Wanted to get clarification on this. Does it mean that you assume investing in dividend growth stocks inside a tax sheltered plan (401k, IRA, Roth)? Also, would you suggest DGI in a taxable brokerage account? (with a 15% hit every year on qualified dividends). Wanted to get your insights on that. Thanks much. Ken, one of the fun things about writing an article is that I almost always have no idea what sentence in a piece will capture a reader’s attention. When I first used the phrase “assuming optimal tax strategy”, I was just trying to shake up my vocabulary and find another way to say “pre-tax returns.” In terms of specific, the best way to achieve optimal tax strategy would be to use a tax shelter like a Roth IRA which consists of contributions made with after tax dollars, and that allows the money to compound tax-free in the account and when it comes time for distributions. Personally, I’m a fan of dividend stocks in a brokerage account. While I’m sympathetic to anyone who dislikes the current tax rates, and I think it is unfortunate that dividends are taxed at all since they are already taxed 35% or so at the corporate level, but realistically speaking, the current 15% tax structure (for most of us) is about as good as we can ask for. My favorite Charlie Munger quote is this: “Drowning in income is fun.” If you craft a life that lets you have hundreds of dollars in dividends coming into your checking account each month, life gets a lot more fun when you realize you get paid just for being alive another month. I choose to think of my stocks as “my little workers”. If a buy 100 shares of Conoco, I think I have hired 100 different workers that are each going to work for me to generate $2.64 in business income each year. Logistically, that works out to $66 payments to your checking account every three months. Those “dividend workers” are only taxed at 15%. For most of us in the workplace, we’re looking at tax rates over 20% and into the 30%. Also, I happen to like high-quality companies. Good things happen when you load your portfolio with Coca-Cola, Johnson & Johnson, and ExxonMobil for long periods of time. Some people buy them because they are dividend-paying companies, and others buy them because they are excellent company. Either way, you end up with a stock that pays a growing dividend in your portfolio. If you wanted to avoid and/or minimize taxation, you could put a good life together by adding Berkshire, Becton Dickinson, IBM, etc. to your portfolio, and those companies either pay no dividend or a low dividend with a high dividend and earnings growth rate. That strategy could work for people, too. The question becomes: What is your step by step investing strategy? Is your goal to achieve as much wealth as possible without paying much by way of taxes? If that is your goal, concentrated positions in companies like Berkshire and IBM might make sense. Or are you interested in turning your household’s balance sheet into an income fortress that feeds money into your account on a regular basis, and you just accept the 15% tax rate as the cost of doing business? If you can get decent-sized positions in Exxon, Coca-Cola, Johnson & Johnson, Colgate-Palmolive, Wells Fargo, Chevron, Procter & Gamble, and so on, right there you have 28 cash deposits sent to your checking account each year. On average, you’d get money deposited into your account every other week. And that is just with those seven companies. Imagine if you spend the next twenty years of your life gradually accumulating two dozen of the most powerful dividend growth firms on the planet? That would get you 96 dividend checks per year. At that point, your checking account is making it rain. You’re getting money deposited into it every three to four days. In a world where others are drowning in student loan debt, cars, mortgages, and what have you, you get to be on the flip side of it. The crazy thing about the whole process is that the dividend grows over time, provided you pick a solid business. Not only do you get four checks deposited to your account each year, but the amount goes up next year. This isn’t fantasy land. It’s a real life reality for people that own Coca-Cola, Colgate-Palmolive, and Johnson & Johnson because those companies have been giving investors dividend hikes for over half a century. In my case, I’m heavily influenced by Charlie Munger’s warning that the worst outcomes are the result of jealousy that accompanies “seeing other people get richer faster than you.” It all comes down to what constitutes “enough” for you. For me, I like companies like Coca-Cola and Johnson & Johnson that grow earnings and dividends by 8-12% annually with a high degree of certainty. Shareholders in those companies receive raises in excess of inflation by 4-8% each year. For those companies, it’s like clockwork. That’s what I consider a dominant investing life to look like. You buy the most badass companies in the world, and receive your cash benefits in quarterly dividend installments as part of the process of being a long-term owner. It all depends on how you get your kicks, and what brings you satisfaction. Some people like to see a $10,000 brokerage account turn into a $25,000 brokerage account as quickly as possible. I get that. Personally, I like to collect little money machines. For instance, I just checked my account today and saw a dividend from Conoco. I bought that company way back when, yet the company continues to reward me even though I’ve stopped “thinking” about it. I love the idea of receiving cash rewards today for decisions I made many yesterdays ago. For me, it’s as much about creating an enjoyable way to live as it is about “maximizing” wealth. Tax rates are only 15% right now. 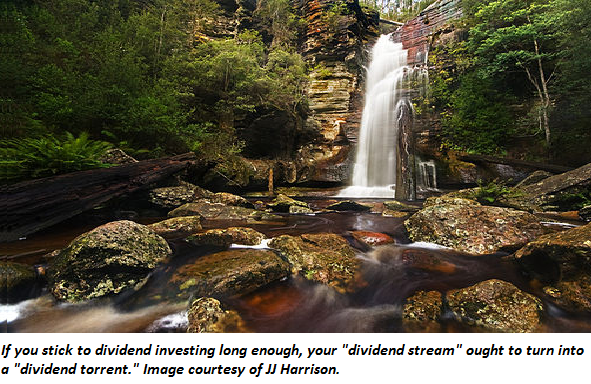 Most of the blue-chip companies tend to pay dividends, so you will likely find yourself owning dividend stocks whether that is your purpose or not. It all comes down to your style, and how you want to structure your life.